Aaron is a dynamic results oriented professional with exceptional talent to manage the entire fundraising cycle from initial contact, cultivation, request, closing and stewardship. He is equally at ease in leadership roles or as a team player. Aaron leads by example combining a collaborative methodology to explore ideas and resolve complex problems. Combined with his exceptional capacity to meet deadlines, he demonstrates a compelling work ethic and commitment to excel in all pursuits. Previously, Aaron served as the Vice President of Development at Dignity Health St. John’s Healthcare Foundation in Oxnard, California. At the same time he led all efforts for St. John’s Healthcare Foundation to include Capital Campaign, Grant Request Coordination, Donor Clubs, Annual Campaign Efforts, Marketing Events and Planned Giving. 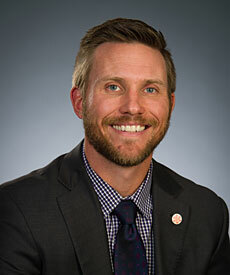 Aaron holds a Bachelor of Science in Business Management from the University of Phoenix, and an Associate of Arts from Glendale Community College. His Business affiliations include D.A.R.E. role model for youth, Payson, Carefree/Cave Creek and Glendale, Arizona Chamber of Commerce charity events. He has served on the Camarillo Chamber of Commerce and in the Rotary of Oxnard, California. Aaron is a proud father of 5, so you can find him as a volunteer coach on the sidelines or working beside his kids in church activities and youth groups. He and his wife, Ashley, rare also leaders for their small group at Church.